On September 8th DesignHouse met in Pittsburgh for our 3rd Jam in the Steel City. Partnering with Catalyst Connection, we brought together designers, entrepreneurs, and manufacturers together at Alphalab Gear to learn about the importance of Designing for Local. The evening started with Paul Hatch’s Design for Local presentation discussing the trends leading DesignHouse to discover the gap between the standard design process and getting products manufacturing locally. Hatch spoke about a new way to think about it, "Just as the movement for local food has inspired chefs to refine their menus, local manufacturing can inspire product design if we reverse the process and design for local manufacturing." As a practice for this process, we introduced the group to Cygnus Metal Company, a full service metal machining, fabrication and assembly in Saxonburg, PA. CMC works in a variety of industries- such as transportation, defense or medical- and has the capacity to meet these industry’s complex standards and paperwork. Check out some of their amazing cuts and fabrications below. Speaking with Jodi Ricketts, CMC's Vice President of Sales and Marketing, before the event, she understood the importance of continuing to bring innovative ideas into their heavily complicated business to stay ahead. "I told my manager, we need to be a part of this." she told us. 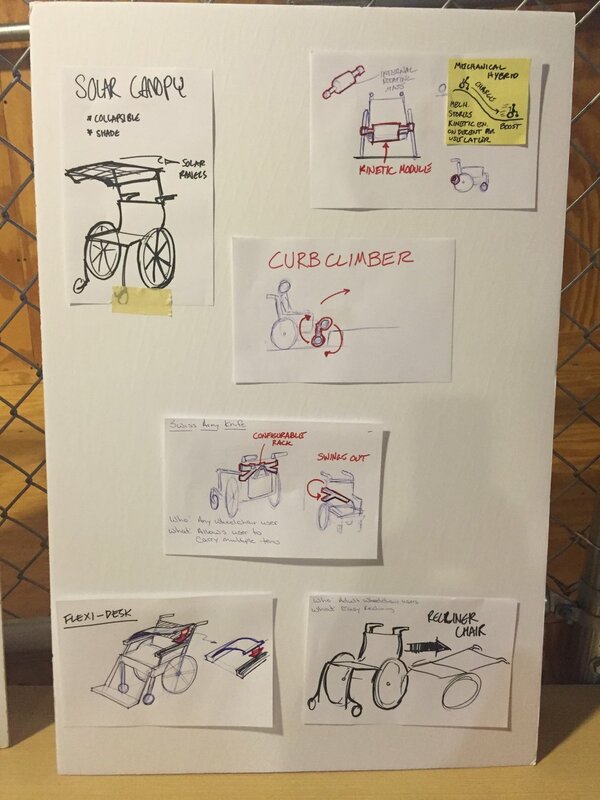 Seeing that there was an opportunity to expand their manufacturing into the medical industry but also wanting to explore new, less comfortable opportunities, we Jammed around 3 topics: wheelchair accessories, lighting, and IOT storage. Teams chose one of these areas and ideated around CMC’s manufacturing capabilities through the Design Thinking process. At the end of the evening each team shared their ideas with the group- saw everything from elegant lighting for public walk ways to sensing school lockers and stair climbinb wheelchairs. You can see some of what was captured below. Please follow this blog to see what happens as we work with students from Carnegie Mellon to develop these into concepts!